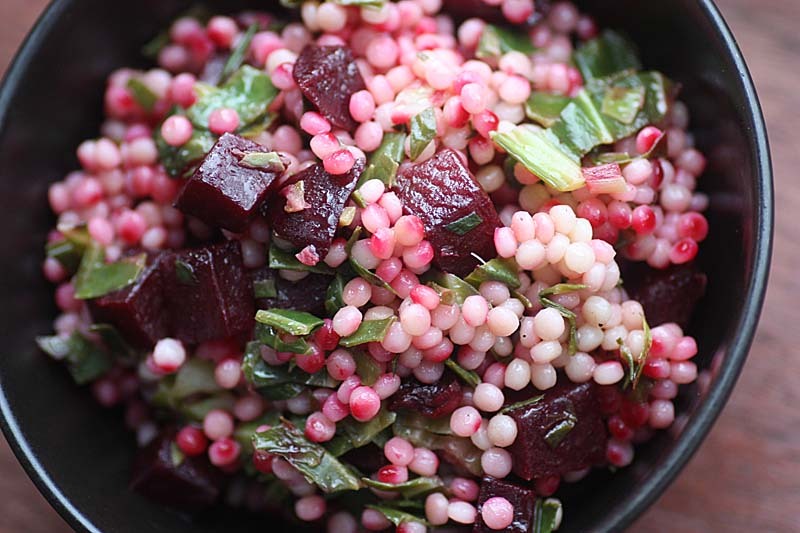 This Beetroot Salad has a mouthful of a name 'Balsamic-Roasted Beetroot with Winter Greens and Pearl Couscous'. After pottering in the garden, this was our lunch yesterday. Its a simple recipe. 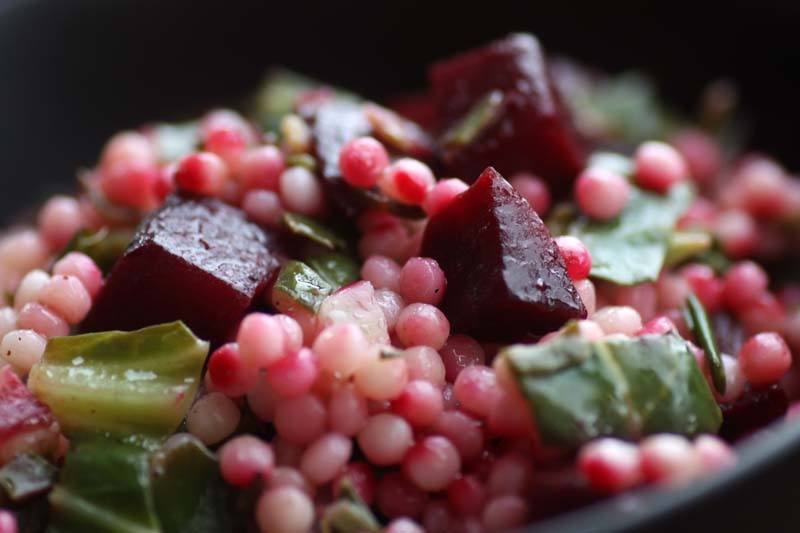 What makes it different is the pearl couscous tainted red by the bleeding beetroot juices. Pearl couscous is also known as Jumbo couscous, Giant couscous, Moghrabiah, Israeli couscous; and/or Jerusalem couscous. It should not be confused with the traditional semolina couscous. Pearl couscous as the name suggests are round beads or tiny balls. Unlike traditional couscous, pearl couscous is made from baked wheat rather than semolina. It is very similar to pasta in that it holds it shape and texture. Whilst eating it reminded me of orzo, a rice shaped pasta. This Beetroot Salad was amazing to look at; and certainly had the Wow factor, but the taste was a bit of a let down. Although the colours penetrated the pearl couscous (the longer its left the colour deepens), the flavours of the beetroot did not infuse these pasta balls. I struggled for years to find Mograbiah or Pearl couscous, so if you can't find any, it can easily be replaced with traditional North African couscous that are readily available in most supermarkets and health shops. I am submitting this to Presto Pasta Nights #212. 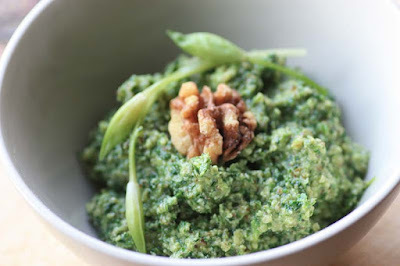 For those of you who are new to Presto Pasta Nights, or PPN as it is fondly known was founded by Ruth Daniels of Once Upon a Feast and each Friday night a different host posts a roundup of pasta dishes submitted by bloggers from around the world. Preheat oven to gas mark 7. Put the beetroot in a roasting tin with the oil, vinegar, garlic and salt to taste. Mix well and cover the tine with foil. Roast for 45 minutes or until tender. Whilst the beetroot is roasting, in a large bowl, whisk the dressing ingredients. Set aside. Then boil some water in a pan, when boiling add the pearl couscous and cook like pasta until al dente. Drain and stir into the dressing and set aside. In another pan, either steam or boil the winter greens, when tender. Drain and stir into the pearl couscous. When the beetroot is roasted, stir into the couscous along with any roasting juice, stir well and allow to stand for about 30 minutes (the longer the better) to allow the colour and flavours to mingle. Serve topped with optional feta cheese cubes. ooh those pink pearls look so pretty! I've been meaning to try Israeli cous cous at home - it always looks so delicious. I like that you paired it with the beets - yum! I have just discovered your wonderful blog after you left a comment on my post about the dog kennel being used as a chicken run. 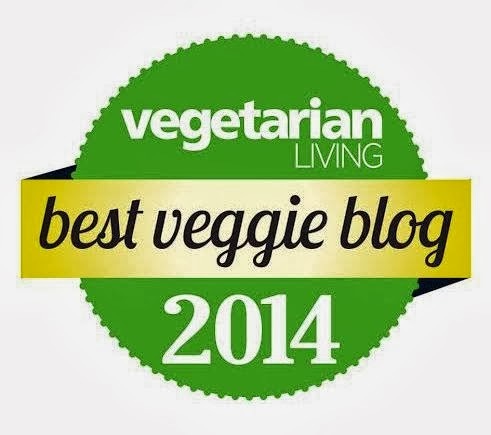 I've just become a follower here and will be adding your site to by sidebar, under Food Blogs. I look forward to exploring your blog! This must surely be one of the most beautiful looking salads ever! These really do give a wow factor! I'm impressed! They look great! This looks amazing! I had a salad very much like this in Sri Lanka but they had added some oranges...it was beautiful. I will definately be trying this one! We tried the pearl couscous once, and were similarly unimpressed. Love the traditional type though - especially with a lamb tagine. Oooooh girl!!! Yours is even MORE beautiful with all the color in it@@@ Your meals always look so wholesome and amazing!! This is so pretty, veru inventive. Thanks for sharing the recipe. I have never seen Israeli couscous here in Germany, but I see that quite a lot of recipes appear in the blogospere lately. Hopefully, one day I can get my hands on some ... your recipe looks really fabulous! Wow, looks very interesting... the colors, especially! This looks wonderful. Now I really hope my beetroot grows, so I can make this with it! I'm really disappointed that I'm not partaking, but Maybe I'll be able to participate in next years Nut roast challenge :) Looking forward to the submissions! Thank you so much Jesse @ Happy Go Lucky Vegan. Thank you so, so much Brenda of My Backyard Farmyard. I'm delighted to read you found it a beautiful looking salad. Thank you H of My Little Bit of Green. I'm very interested to read that you had a salad very much like this in Sri Lanka, it sounds amazing with the zingy oranges. Its good to read that you were similarly unimpressed with the pearl couscous. Its sure impressive to look at, but to eat is a different story. Like you, I agree the traditional type is much better as it takes on flavours of whatever you put with it - be it roasted vegetables or a lamb tagine. Thank you so much Jennifurla. Hopefully, you'll get your hands on some, but i have to tell you its not that exciting in flavour - the pearl couscous - not the beetroot salad! I hope your beetroot grows too. I am sure I will try this one..first I thought they are sago pearls..:)tempting ! Yes I can see the simialrity with sago pearls. I'm so pleased that you came on over and humbled that you have chosen to become a follower. Thank you so much. 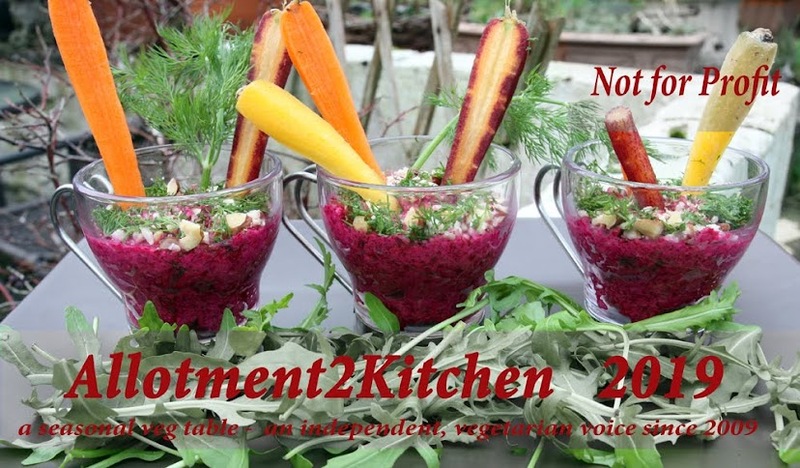 I always don't know how to prepare beetroots, your site is so full of good ideas!